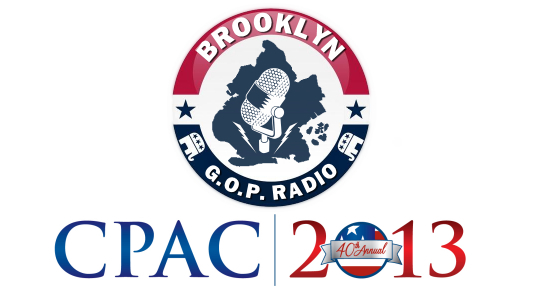 Home / Brooklyn GOP Radio / CPAC / Election Law / Gene Berardelli / IWF / J. Christian Adams / Julie Gunlock / People's Republic of New York / PJ Media / Russell Gallo / Sabrina Schaeffer / Tons of Guest Announcements for CPAC! Tons of Guest Announcements for CPAC! We've been going non-stop confirming guests for our live shows and for interviews that we'll share with you during and after CPAC - and if you've been following @BklynGOPRadio on Twitter, then you know some of them already! But for the rest of you, here are some of the guests we're going to bring you from CPAC! But stay tuned - BIG announcements to come tomorrow and beyond! 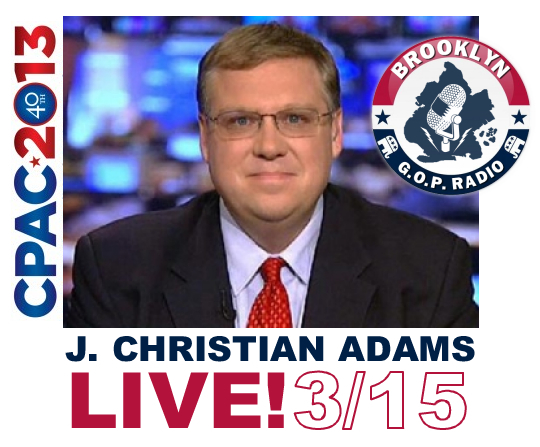 Election Attorney J. Christian Adams will be appearing LIVE on Brooklyn GOP Radio! This is huge for me - I've wanted to sit down with Mr. Adams since listening to him at a Judicial Watch presser about voter fraud with "True the Vote". A contributor to Breitbart and other sites, Adams is an former DOJ attorney who takes on the Obama Administration on issues surrounding our right to vote. Most notably, Adams accused the DOJ of racial bias in many affairs, most notably its handling of a voter intimidation case against members of the New Black Panther Party. 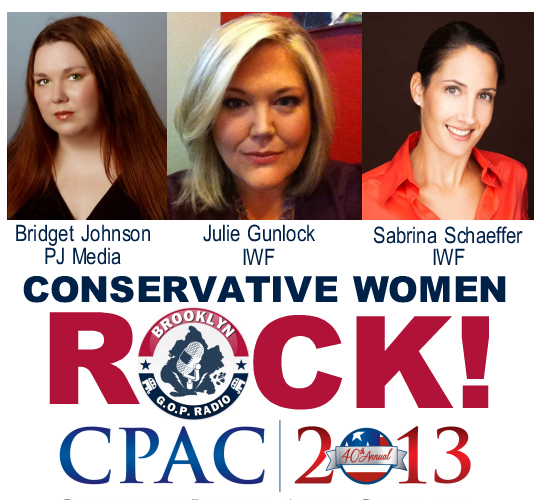 We'll be featuring a host of proud conservative women who will be roaring all over CPAC! Bridget Johnson: Washington Editor, PJ Media: Bridget is a career journalist whose news articles and opinion columns have run in dozens of news outlets across the globe. Bridget first came to Washington to be online editor at The Hill, where she wrote The World from The Hill column on foreign policy. Previously she was an opinion writer and editorial board member at the Rocky Mountain News and nation/world news columnist at the Los Angeles Daily News. She has contributed to USA Today, The Wall Street Journal, National Review Online, Politico and more, and has myriad television and radio credits as a commentator. Bridget is Washington Editor for PJ Media. Bridget will be on-air LIVE on Thursday's show! Julie Gunlock: Independent Women's Forum: Julie is a senior fellow at the Independent Women's Forum. Before joining IWF, Gunlock served as a Professional Staff Member on the Senate Homeland Security and Governmental Affairs Committee and on the House Homeland Security Committee, and on the staffs of Ohio Senators Mike DeWine and George Voinovich. She is the Director of the IWF's "Project on Culture of Alarmism" which examines how Americans are bombarded with messages about how everyday products threaten their health and the health of their children, how the media hypes the findings from scientifically-dubious studies and how politicians and government regulators seize on them to promote regulations that expand their power and so that they can reassure the public they are doing something to protect Americans. Sabrina Schaeffer: Independent Women's Forum: Sabrina is the Executive Director of the Independent Women's Forum. Among her many accomplishments, Sabrina has served as the speechwriter for Sen. George Voinovich of Ohio and as the Director of Media Relations and Public Affairs at the Republican Jewish Coalition in Washington, DC, where she frequently served as a spokeswoman for the organization. Sabrina will be joining up LIVE on Friday! Both Sabrina and Julie will be part of a forum at CPAC called “How I Learned to Stop Worrying & Love Plastic Water Bottles, Fracking, Genetically Modified Food, & Big Gulp Sodas” - and of course, we'll be talking about Mayor Bloomberg's soda ban and its epic fizzle with both of them! And there's a lot more where these great guests came from! Check back tomorrow!